Definitive US Stamps were completely redesigned, beginning in 1922. These new definitive postage stamps, called the Fourth Bureau Issue, featured different portraits / subjects. They were a refreshing replacement for the monotonous definitive stamps of the Third Bureau Issue of 1908-1922. The new definitive US postage stamps of the Fourth Bureau Series are among the most beautiful of all US definitive postage stamps. 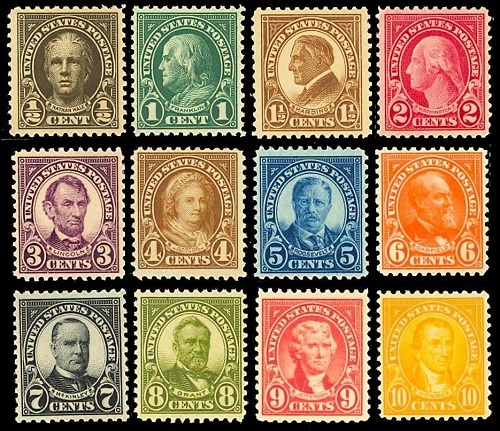 During their period of use, from 1922 to 1938, they went through several production transitions, but these were nothing compared to the never-ending complexity of the US stamps issued between 1908 and 1922. All of the following stamps were printed on white, unwatermarked paper. The first issues of 1922-1923 are shown and described directly below. For content brevity, each major type will only be illustrated and described once. Production variations will be described in text and followed by a technical attributes table. Format Type: Panes of 100. Denominations: 1/2 Cent - 5 Dollar. 1/2 Cent - Nathan Hale (1755-1776) - A soldier in the Continental Army during the American Revolution. Captured and executed by the British for spying. 1 Cent - Benjamin Franklin (1706-1790) - Author, printer, politician, scientist, statesman, diplomat, and the first Postmaster General. 1-1/2 Cent - Warren G. Harding (1865-1923) - 29th President of the United States. 2 Cent - George Washington (1732-1799) - Farmer, military commander, statesman, and the 1st President of the United States. 3 Cent - Abraham Lincoln (1809-1865) - 16th President of the United States during the American Civil War. 4 Cent - Martha Washington (1731-1802) - The wife of President George Washington and the first First Lady of the United States. 5 Cent - Theodore Roosevelt (1858-1919) - 26th President of the United States. 6 Cent - James A. Garfield (1831-1881) - 20th President of the United States. 7 Cent - William McKinley (1843-1901) - 25th President of the United States. 8 Cent - Ulysses S. Grant (1822-1885) - Commander of the Union Army during the American Civil War and the 18th President of the United States. 9 Cent - Thomas Jefferson (1743-1826) - Author of the Declaration of Independence, Secretary of State under President Washington, Vice President of the United States under President Adams, and the 4th President of the United States. 10 Cent - James Monroe (1758-1831) - 5th President of the United States. 11 Cent - Rutherford B. Hayes (1822-1893) - 19th President of the United States. 12 Cent - Grover Cleveland (1837-1908) - 22nd and 24th President of the United States. 14 Cent - American Indian - From a 1905 photograph of Hollow Horn Bear (1850-1913), a Brule Sioux that attended the inauguration of President Theodore Roosevelt. 15 Cent - Statue of Liberty - From an 1888 engraving by Charles Skinner. The statue, in New York Harbor, was a gift from the "people of France" to the "people of the United States" in 1886. 20 Cent - Golden Gate - From a painting by W. A. Coulter (1849-1936). The design depicts the San Francisco Harbor or Golden Gate, prior to the construction of the famous Golden Gate Bridge. 25 Cent - Niagara Falls - the American side of the Falls, from an old photograph taken from Goat (Luna) Island. 30 Cent - American Buffalo - From a 1901 drawing of a Bison in the Washington, D.C. zoo by Charles R. Knight (1874-1953). 50 Cent - Arlington Amphitheater - Based on a photograph of the amphitheater, completed in 1920 and located in Arlington National Cemetery. 1 Dollar - Lincoln Memorial - Based on a U.S. Army Signal Corps photograph taken just after its completion in 1923. 2 Dollar - U. S. Capitol - The United States Capitol building, based on a photograph in the files of the Bureau of Engraving and Printing. 5 Dollar - America - Engraving of the head of the Statue of Freedom atop the United States Capitol dome. The statue, by Thomas Crawford (1814-1857), was erected on December 2, 1863. Between 1923 and 1925, three of the lowest denominations were issued in imperforate panes. Format Type: Panes of 100. Designs: 19.25 x 22.25 mm. Denominations: 1 Cent, 1-1/2 Cent, 2 Cent. Format Type: Panes of 100. Designs: 19.25 x 22.50 mm. Up until 1923, ALL definitive US stamps issued in perforated or imperforate panes were printed on the Flat Plate Press. Between 1923 and 1926, the Bureau of Engraving began experimenting with the possibility of printing the pane-format definitives on Rotary Press plates. In early 1923, experimental printings of the 1 Cent and 2 Cent postage stamps on Rotary Press plates, using coil waste paper, took place. Enough of these printings were made at the time, that the resulting stamps, today, are relatively plentiful and inexpensive. Format Type: Panes of 100. Designs: 19.75 x 22.25 mm. Separation Type: Perforated 11 x 10. Denominations: 1 Cent, 2 Cent. Between 1923 and 1926, more Rotary Press definitive US stamp printings, using perforation gauge 10 occurred. All of the US stamp denominations from the 1 Cent through the 10 Cent were used for these printings. These perforated 10 stamps are relatively common, but well centered examples are VERY difficult to obtain. Denominations: 1 Cent - 10 Cent. Also in 1923, experimental Rotary Press printings, utilizing Rotary Press waste paper, were produced, with the stamps being perforated 11. These perforated 11 printings are all very rare and are seldom obtainable. The first of these printings utilized coil waste paper. Format Type: Panes of 70 and 100. Designs: 19.75 x 22.25 mm. The last of these printings utilized Rotary Press sheet waste paper. Format Type: Panes of 70 and 100. Designs: 19.25 x 22.50 mm. Between 1923 and 1929, the Bureau of Engraving and printing produced Rotary Press Coil US stamps, utilizing the lower denomination designs of the Fourth Bureau Issues. On the Rotary Press stamps, there are two types of the 2 Cent denomination. 2 Cent - Type I - No heavy hairlines at top center of head. Outline of the left acanthus scroll generally faint at the top and towards the base at the left side. 2 Cent - Type II - Three heavy hairlines at top center of head, with two of them being outstanding in the white area. Outline of the left acanthus scroll is very strong and clearly defined at the top. Format Type: Horizontal Coils. Designs: 19.75 x 22.25 mm. Separation Type: Perforated 10 Vertically. Denominations: 1 Cent, 1-1/2 Cent, 2 Cent - Type 1, 2 Cent - Type 2, 3 Cent, 4 Cent, 5 Cent, 10 Cent. Format Type: Vertical Coils. Designs: 19.25 x 22.50 mm. Separation Type: Perforated 10 Horizontally. Two new denominations were added to the Fourth Bureau Series between 1925 and 1926. They are both shown in the scan above. Denominations: 13 Cent, 17 Cent. 13 Cent - Benjamin Harrison (1833-1901) - 23rd President of the United States. 17 Cent - Woodrow Wilson (1856-1924) - 28th President of the United States. Between 1926 and 1934, the Bureau of Engraving and Printing re-issued the 1922-1923 Fourth Bureau Issue US stamps, from the 1 Cent through the 10 Cent denominations. These new US stamps were perforated 11 x 10-1/2, and they were all printed on the Rotary Press. Separation Type: Perforated 11 x 10-1/2. Denominations: 1 Cent, 1-1/2 Cent, 2 Cent - Type 1, 2 Cent - Type 2, 3 Cent, 4 Cent, 5 Cent, 6 Cent, 7 Cent, 8 Cent, 9 Cent, 10 Cent. In 1929, the US Post Offices in the states of Kansas and Nebraska were having problems with frequent burglaries. To prevent further problems, the Bureau of Engraving and Printing overprinted sheets of US stamps being sent to Kansas and Nebraska post offices with either "Kans." or "Nebr." . These overprinted stamps were only in use for a short while, and when the initial stocks of them ran out, the overprinting was discontinued. These stamps were all from the Rotary Press, perforated 11 x 10-1/2 issues of 1926. Two examples are shown above. These stamp overprints can be easily forged. Caution is recommended, especially when purchasing mint condition sets of them. One easy check to use is as follows: The un-overprinted rotary press stamps usually have two breaker ridges on the back sides. The overprinted stamps usually have only one breaker ridge on the back sides. Denominations: 1 Cent, 1-1/2 Cent, 2 Cent, 3 Cent, 4 Cent, 5 Cent, 6 Cent, 7 Cent, 8 Cent, 9 Cent, 10 Cent. Scott Catalog Numbers: 658-668 (Kans. Overprint), 669-679 (Nebr. Overprint). In 1930, the 1-1/2 Cent and 4 Cent denominations of the Fourth Bureau Issue were replaced with new stamps. These Rotary Press US stamps were issued both in perforated pane format and in horizontal coil format. All of them are shown in the scan above (Sc. #684-87). The new 1-1/2 Cent stamp, printed in brown, featured a new "facing" portrait of former President Warren G. Harding, replacing the profile portrait that had previously been used. The new 4 Cent stamp, also printed in brown, featured a "three-quarter-facing" portrait of former President of the United States and Chief Justice of the Supreme Court William H. Taft (1857-1930), replacing the portrait of Martha Washington that had previously been used for this denomination. During 1931, the Bureau of Engraving and Printing re-issued the current Fourth Bureau Issue US stamps, from the 11 Cent through the 50 Cent denominations. These new stamps were perforated 11 x 10-1/2, and they were all printed on the Rotary Press. From this time, until well past the middle of the 20th Century, almost all the definitive US postage stamps have been printed using the Rotary Press. Denominations: 11 Cent, 12 Cent, 13 Cent, 14 Cent, 15 Cent, 17 Cent, 20 Cent, 25 Cent, 30 Cent, 50 Cent. With the increase in the first-class letter postage rate from 2 Cents to 3 Cents, the Bureau of Engraving and Printing re-issued the 3 Cent denomination US stamps in 1932. The new 3 Cent stamps featured the Gilbert Stuart portrait of George Washington, replacing that of Abraham Lincoln previously used on this denomination. These new US stamps were issued in perforated pane format, horizontal coil format, and vertical coil format. All of them are shown in the scan above (Sc. #720-22). At the same time, the 6 Cent denomination stamp, featuring the portrait of James A. Garfield, was issued in horizontal coil format. It is also shown in the scan above (Sc. #723). This concludes the Fourth Bureau Issues. 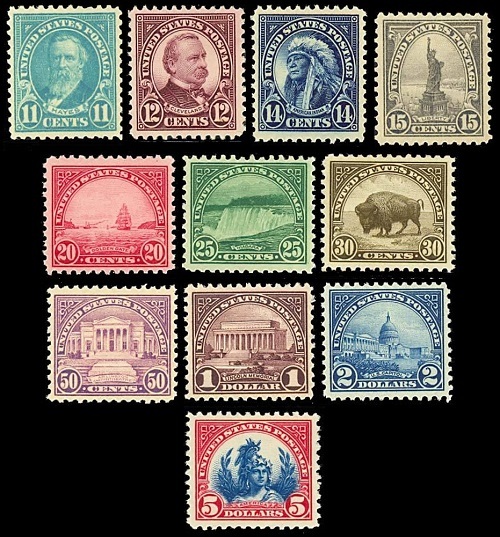 These popular US stamps continued in use, until they were replaced by the Presidential Series of definitive postage stamps in 1938.